You have to develop a USB 2.0 device in a rush? No problem: Boot up the PC, take PICstick from its package and connect it to the USB port, and put the attached CD into its drive ... ready. This sounds like a receipe for the very hurried people. And it is. A PICstick contains the complete USB communication on board as well as on the PC side. Yo can concentrate on programming your application. The PC side driver (Windows or Linux) emulates a serial port and is really easy to access. 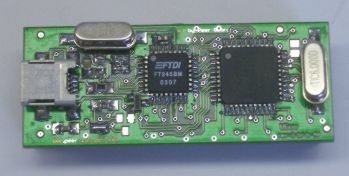 On the module side there's a USB-2.0 hardware controler with implemented communication protoocl. The PIC resources are exclusively available for your application. PICstick ist programmed for fast success. The tutorial contains several sample programs for the module and the PC (Windows and Linux). In short time you'll be through the development process and got a ready-to-run application in the flash memory on the module. All prices and technical data are preliminary and subject to change.